Paris, Tenn.–There are scarecrows aplenty in downtown Paris, populating the court square once again for this year’s Scarecrows On The Square. 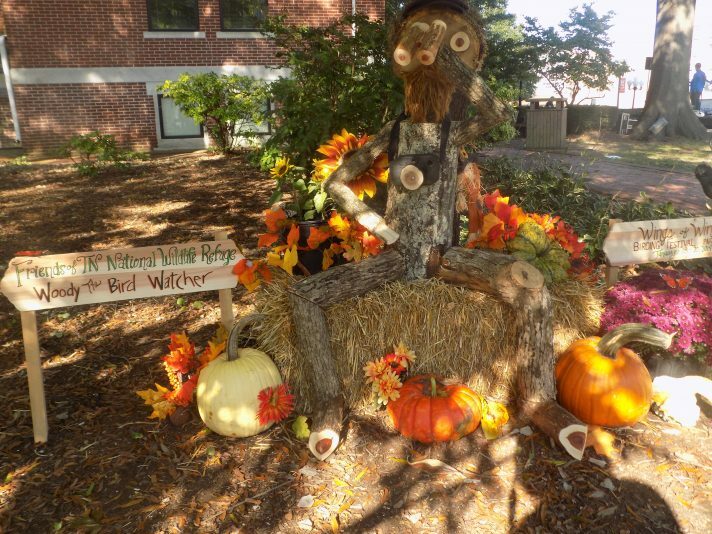 Once again, the scarecrows are creative and colorful, from the Cat-Fish Kitty created by the County Clerk’s Office to the Super Cop scarecrow from the Paris Police Department to the colorful “Bird Nerd” from the Friends of the Tennessee Wildlife Refuge and more. The scarecrows will be on display all month, with the winners announced at the Spooktacular event October 20 downtown. In photos, the “Bird Nerd” from the refuge; Cousin It and his cousins from K & B Supplies for Success; and the Cat-Fish Kitty from the County Clerk’s office. (Photos by Shannon McFarlin).